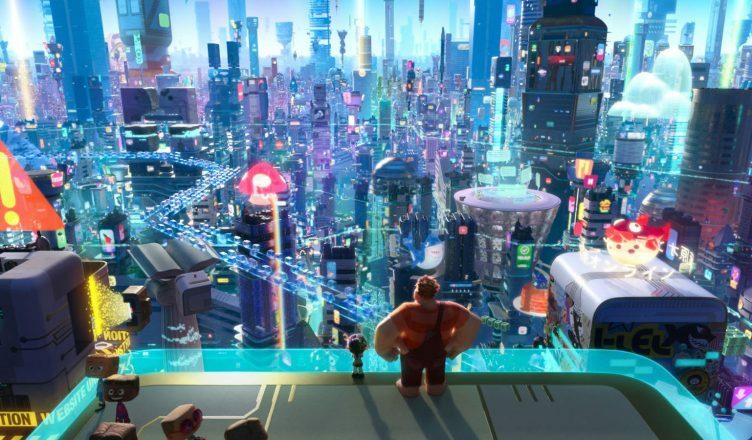 “Ralph Breaks the Internet” ventures into a buzzing and unpredictable technological world beyond the accustomed scene of classic arcade games. Six years after the release of “Wreck-It Ralph,” we are graced with a sequel that once again features the good-bad guy who demolishes buildings with his fists, and his spunky, candy-coated friend who glitches during car races. It’s out with the old and in with the new, as “Ralph Breaks the Internet” explores a realm away from retro-arcade games and connects to the inner workings of the World Wide Web. After the steering wheel of the Sugar Rush game console breaks, Vanellope von Schweetz (Sarah Silverman) is left discouraged and homeless with her game permanently out of commission. But when she and Wreck-It Ralph (John Reilly) discover that a spare part could be purchased from a nebulous and enigmatic place called “the Internet,” they don’t hesitate to jump to the nearest WiFi router and travel into the digital dimension to find it. With full gusto and a pinch of naivete, the dynamic duo traverses through the fictitious behind-the-scenes world. “Ralph Breaks the Internet” puts a creative spin on the depiction of the internet, allowing audiences that grew up with this digital network to witness it through a fresh set of eyes. Vanellope and Ralph begin to learn the intricacies of online platforms that feel as equally new and anticipating to the viewers. By personifying internet culture, this movie provides amusing interactions between the two heroes and manifestations of algorithms, malware viruses, and search engines. Each convoluted concept is shaped into a likable character with a pertinent personality, such as a pop-up ad having a scruffy, sketchy disposition, and the video-sharing algorithm having a trendy, selective style. Every character immediately becomes distinctly memorable, as we start to associate their specific attitudes with tools of the actual internet. The film’s setting also cleverly displays a bustling, sleepless city in order to deliberately mirror the internet’s constant movement and rapid pace. The space starts to feel three-dimensional and alive, as Vanellope and Ralph weave through legions of online users and enter edifices that represent different websites and servers. Similar to most cities, the internet is also a place of corporate fixation and progression, so we witness our pair adapt to modern customs such as monetary video content and popular online gaming. Even though viewers are stripped from the familiar domain of the first “Wreck-It Ralph,” there is an intrigue to see how our vintage characters clash and collaborate with the modern advancements of newer territory. Although the movie celebrates the innovation and growth of the internet, it doesn’t excessively glorify it, which is a sigh of relief. “Ralph Breaks the Internet” attempts to maintain this balance by also touching on the web’s dark and ugly facets. Though the negative aspects are distilled in order to keep a lighthearted tone, there is still subliminal commentary on the potential toxicity that could hurt an entire generation. But, the film is cautious to not be too preachy or denigrating in discussing the dangerous side of the internet. As “Ralph Breaks the Internet” distinguishes internet culture, it also generationally distinguishes its audience. The blockbuster locks millennials’ and Gen Z’s sense of comedy into place, using a plethora of memes and viral videos to be hilarious and relatable. Although there are moments with one-too-many outdated internet references, the film still holds up by priding an entire generation as a social media zeitgeist. It more or less reflects the current ironic and personal humor, so that young viewers can rewatch the animation in a distant future with a wistful semblance of nostalgia. To instill even more nostalgia in the audience, this movie is also packed with pop culture references, ranging from Disney itself to Marvel to Star Wars to Pixar. Though it is exciting to see big crossovers, it also becomes quite unsettling, yet impressive, for film spectators to know that the Disney corporation owns the rights to all these popular studios and franchises. This conglomerate giant dominates the entertainment industry and has a majority of consumers wrapped around its finger. It’s a cultural monolith that succeeds frighteningly well by giving the people what they want. Hence, “Ralph Breaks the Internet” garners the most laughs by turning comically meta and self-referential at many points. It pokes fun at Disney tropes and cliches and peppers in the right amount of eponymous cameos and Easter Eggs for viewers to enjoy. These self-aware gimmicks aren’t milked, and instead make the audiences feel like they’re all in on well-received inside jokes. “Ralph Breaks the Internet” freezes parts of the digital 21st century by forever plastering its culture on screen for audiences to remember. It’s a film about the components of the internet, but it also contains sweet moral messages of friendship and self-discovery. As the two titular arcade characters usher us through a reimagined Interweb, the audience can’t help but feel awe and sentiment, like they’re immersing into a new world for the first time. Coen Brothers performed extremely well on this movie. Recently watched it on Netflix. Enjoyed thoroughly. watch all movies & TV shows for free on PC using Cinema apk for Windows. All movies are available in HD quality.